This is a short report covering Michaelmas Cay, located off the coast of Cairns on the Great Barrier Reef. Michaelmas Cay is a small vegetated coral cay which is a protected seabird sanctuary. This report provides some general information about Michaelmas Cay on the Great Barrier Reef – a birding site usually visited when you travel to Cairns. It provides a summary of the birds seen on a recent trip to the Michaelmas Cay. 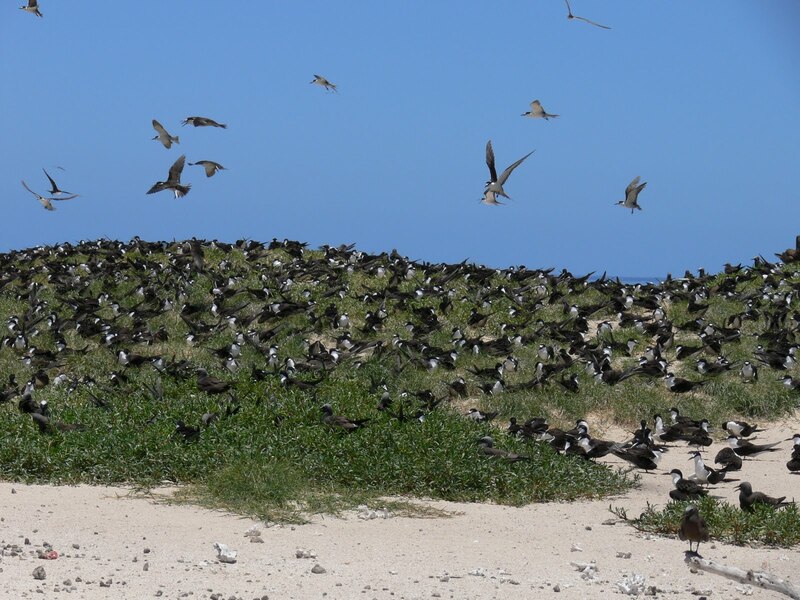 Overall 38 species of birds have been recorded on Michaelmas Cay – 35 seabirds and 3 woodland species. The main breeding species are Sooty Tern, Crested Tern, Common Noddy and Lesser Crested Tern. Occasional breeders include Silver Gull, Black-naped, Bridled and Roseate Tern, Black Noddy and Ruddy Turnstone. Also don’t forget that Michaelmas Cay is surrounded by some magnificent coral reefs! I can highly recommend that when you travel at Michaelmas Cay that you take time to go snorkeling. Nearly two million years old and world heritage listed in 1981, the Great Barrier Reef has an amazing 1,500 species of fish. When I travelled to the Michaelmas Cay I went on the Sea Star 2, a great service because it was relatively cheap when compare to similar boat trips. Unfortunately this service finished in 2007. The cheapest option now is to catch the Passions of Paradise (run by the same people), which costs about AUS$130pp. Contact Seastar Cruises, http://www.seastarcruises.com.au/. An alternatively to this is to catch the Ocean Spirit for AUS $189pp, kids $94pp, see http://www.oceanspirit.com.au/.Before you get to the cay, make sure to let the crew know that you want to go ashore to go birdwatching – they are usually more than happy to help.